The Canvas Print Studio - which was founded as a subsidiary of Interact Repro Services in 2009 by Rafal Sokol and brings its customers’ images and photos to life with the production of the highest quality canvases - has installed a new Epson SureColor SC70600 wide format printer. The Canvas Print Studio creates stretched and rolled canvases, poster prints, giclee prints and Epson Digigraphie prints – all from the original pictures and artwork supplied by its range of customers including professional photographers, the general public and trade customers – primarily via the company’s website: www.thecanvasprintstudio.co.uk. Quality and efficiency is at the core of everything The Canvas Print Studio does. In order to maintain the highest quality, longest-lasting output, the company uses branded canvas media, original inks and premium European pine stretcher bars with wooden wedges. The company also has an impressive, intuitive, on-line ordering system which enables customers to see exactly how their photos will be cropped and what size will work best. When the company first started out with its Epson aqueous large format printers, the production process meant that each canvas had to be printed, dried and then varnished to achieve long-lasting quality. However, with the introduction of the new eco-solvent technology, Rafal Sokol realised he could speed up the production process whilst maintaining the very highest quality output. SMGG is a reseller of a wide gamut of printing hardware and the associated peripherals and was able to offer independent advice as to the best-fit solution for The Canvas Print Studio’s needs. After reviewing the various options available, Rafal Sokol decided upon the Epson SureColor SC70600. 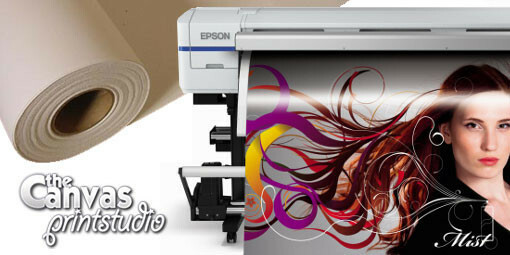 The Epson SureColor SC70600 roll-to-roll printer can produce everything from exhibition displays, posters, banners, textiles, backlit panels and POS materials to vehicle wraps, wallpaper and labels. It is Epson's first 64-inch (162.6cm) printer to support white and metallic ink simultaneously, enabling creative print makers, specialist sign makers and professional display printers to expand their service portfolios. The advanced ink formula means prints are lightfast for up to three years outdoors without lamination. The printer was installed in May 2013. The delivery process was entertaining as the printer was carried through to The Print Studio’s premises in one piece - although it had to be turned on its side to get it through the door!